Jimmi’s lab was strewn with what could only be described as junk. Heaps of metal contorted into various forms, but each looking gruesome, were piled in every corner. Scattered around the rest of the room were various other parts and pieces such as cogs and springs and wires. Jimmi himself was frivolously working at a desk that was completely submerged in papers. Blueprints, notes, and unreadable scribbles had been crumpled up and tossed aside until he was left with a sea of paper. “Ahem,” came a sharp voice. Jimmi immediately jumped up from his seat and spilled papers in all directions. “I’m innocent!” he cried as he cowered in fear. He then realized who he was talking to, and saw that she was no ordinary neopet. She had the form of an Usul, yet she seemed to be made of pure darkness. It was like he was staring into the void of space, yet she only seemed partially there. As if she was simply a two-dimensional shadow that was now standing on its own. “Are you the super evil genius?” she asked icily. “Hang on a sec,” Jimmi muttered as he skimmed through his handheld Book of Evil. As he grabbed at her wrist, his hand only clamped around air. “And so you came to me,” Jimmi concluded. “Is it perhaps that I remind you of yourself?” Jimmi suggested. “But does mean that you’ll let me work for you?” Jimmi begged. “Yes, but if you fail me, I shall find a new hero and you shall get no mercy when he takes over the world,” the Usul threatened. “Well then, let’s get started,” Jimmi exclaimed, oblivious to her last remark. 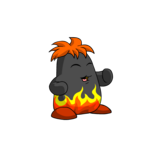 “Ha, lava is no match for the skill of Jimmi Chumpchange,” the Fire Chia exclaimed. He quickly began sorting through the piles of discarded metal. Eventually he came out with a glove. “Again, Jimmi Chumpchange is prepared,” Jimmi cried out. The Chia reached into his pocket and pulled out a button. Upon pushing it he revealed a pipe that opened up in the floor. Sala may have rolled her eyes; it was hard to tell when she was only shades of darkness. The two crept into the tunnel and descended. It got hotter and hotter as they got deeper. Eventually Jimmi felt like he might melt, but they had arrived at their destination. Waterfalls of lava poured together into a sphere a glowing scarlet. “There it is!” Lady Sala cried out. Jimmi pressed a button on his Stretchy Gauntlet and it shot into the burning ball of fire. It emerged quite scorched but still intact with a black rock in its palm. Jimmi investigated. His first discovery was that it was quite hot. He screamed in pain and dropped it. “Grab it, you fool, before it falls back into the lava,” Sala ordered. Jimmi activated his Stretchy Gauntlet again and caught the Heart of the Inferno. This time he kept it in the gauntlet as he investigated it. The dark stone actually had a handle on either end. In the center was a grate like a furnace, inside was a deep amber glowing. “With this power you shall bring all of Moltara to its knees,” Lady Sala laughed. “Aw, I’ve been trying to take over Moltara all my life; can’t we try Shenkuu?” Jimmi asked. “Find, as long as we get something,” Lady Sala sighed. Jimmi stood on a cliff overlooking the mysterious city of Shenkuu. “It won’t look so majestic after it is ravaged by the Heart of the Inferno,” Lady Sala cackled. “Behold my power!” Jimmi boasted as he held the stone in the air. Suddenly the sky turned a foggy orange and clouds began to form monstrously around the city. The clouds began to fall from the sky, only by now they had become balls of fire. As each one dropped, it burst into vicious flames that devoured all. Jimmi laughed maniacally at the panicked screams. “What are you doing now?” asked Sala. “You’ll see,” chuckled Jimmi as he began tinkering with the supplies. Soon he had built a shoddy looking robot; it had the Neovision set in its stomach and the megaphone in its mouth. “Now go, my minion, spread my message,” Jimmi commanded. The robot hovered over to the panicked city and projected Jimmi’s voice as he spoke into a microphone. “People of Shenkuu, you have fallen under the reign of terror of Jimmi Chumpchange!” he cried victoriously. “And some creepy shadowy Usul person,” Jimmi added. “No so fast,” came a booming voice from the flaming city as a knife flew into the robot. The voice and knife both belonged to a tall, strong Ogrin. “I’m going to put a stop to your horror, Chumpchange!” he challenged as he charged through the fire with his knife in hand. “Oh no, we’re doomed,” cried Jimmi. “What’s the big deal?” asked Sala. The Ogrin was closer to the cliff now; the determination in his eyes was burning strong than the fire itself. “Do something!” Jimmi cried as he shook the Heart of the Inferno back and forth. Tendrils of fire sprang forward and reached for the Ogrin. Yet he dodged them easily and began to climb the cliff. Soon he had reached the top and came face to face with a shaking Jimmi. “You’re pathetic,” hissed Sala as she reached for the Heart of the Inferno. Both Jimmi and the Ogrin watched in shock as the grate absorbed her shadowy presence. However, neither of them were prepared for what happened next. The clouds and fire began to the melt together in a horrible demonic flaming figure. A face made out of flames contorted in rage and two burning hands reached out. The Ogrin hero shielded himself in vain as the massive hands surrounded him. All of the fire began to swarm in a hideous storm. Then it ended and all that was left was a statue of the hero and a wisp of an Usul. “I don’t understand,” Jimmi said, puzzled. “So, is it over?” Jimmi asked still confused. Then Jimmi heard the sound of a breath being released and Sala faded into shadow and smoke. The Chia marched down from the cliff and into the town that he had brutally burned. Townsfolk cowered as he walked past the scorched ruins of their homes. Jimmi came to the palace that was now only a shell of what it once had been. He still managed to find the throne and sat upon it. Kitchen hands, why have you been locked in the pantry? Your word doesn't mean anything if you're just going to break it. Calculating is half the battle.